Mystart4.dealwifi.com – How to remove? Mystart4.dealwifi.com is a website promoted as a genuine search provider, but, frankly speaking, it is not even close to being a legitimate search tool. Users who find this search tool set on their browsers should be aware of the fact that their browsers have been hijacked. That is, their browsers’ settings have been changed without their consent. Never trust search tools which show up on browsers without your permission because they are typical browser hijacker infections, and they only pretend to be legitimate. The same can be said about Mystart4.dealwifi.com, which is the focus of this article, so go to delete Mystart4.dealwifi.com today. A number of legitimate search providers is available on the market, so we are sure you will not regret implementing the Mystart4.dealwifi.com removal. The information you need to know about the deletion of this browser hijacker is provided in the last paragraph. Although Mystart4.dealwifi.com is new, we cannot say that it works somehow differently if compared to older browser hijackers. First of all, it also enters computers illegally. Secondly, it changes browsers’ settings (usually browser hijackers alter homepages and search tools, but they might also set a new New Tab URL). Finally, it starts displaying advertisements to users the moment it is set on browsers. These advertisements are not like commercials shown by ad-supported programs or potentially unwanted applications. They take the form of search results to make sure that users click on them. If they do that, they are immediately taken to third-party pages. Of course, Mystart4.dealwifi.com does not promote those websites for free. Most likely, the author of this browser hijacker gets money. It is very likely that this hijacker has been developed to generate revenue only. 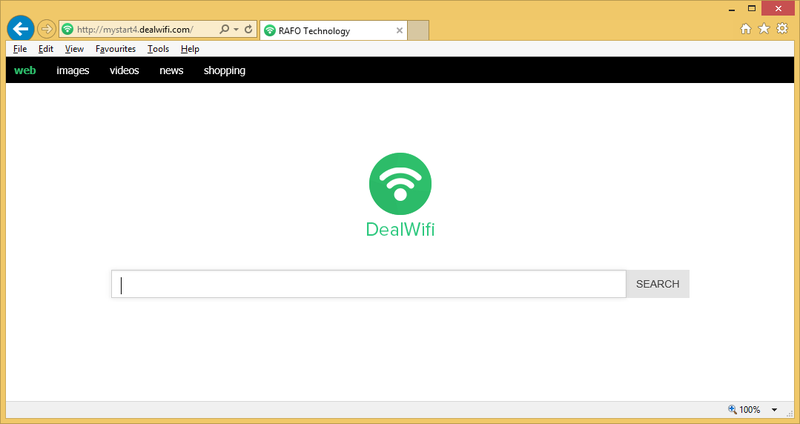 If you have not understood yet, Mystart4.dealwifi.com will not improve your searching experience in any way, so there is no point in keeping it set on browsers either. Go to uninstall Mystart4.dealwifi.com today because it might be too late to do that tomorrow. Why do I see Mystart4.dealwifi.com? If Mystart4.dealwifi.com is visible each time your default web browser is launched, there must be a browser hijacker inside your computer. If you have recently downloaded a program from a P2P website, it explains why it has shown up on your computer. On the other hand, if you are sure that you have not downloaded any program recently, it must be a sign that a browser hijacker infection has illegally entered your computer. Either way, go to delete Mystart4.dealwifi.com from all your browsers. How can I remove Mystart4.dealwifi.com? You can remove Mystart4.dealwifi.com either manually or automatically. Both removal methods are acceptable, but you should choose the more suitable one for you. For example, if you are an inexperienced user, you should not implement the manual Mystart4.dealwifi.com removal because it will be too hard to do that for you. In this case, you should let an automatic scanner do this job for you. If you still decide to delete Mystart4.dealwifi.com manually, start by resetting your web browsers – it is the easiest way to take care of the undesirable search provider in a manual way.